I made this tiny mushroom pincushion from a bottle cap, following Jen Segrest's step-by-step photos on Flickr. I had to add a step that wasn't part of the directions, which was to open up a living room pillow and steal some of the batting to put in this. 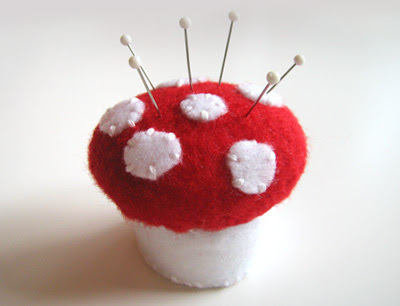 As a pincushion, I know it's not the most useful ever, but who can resist a teeny little stuffed mushroom made of felt? you are like the robin hood of crafters with that batting trick. Exactly. The other couch pillows looked at me in fear, but my pincushions cheered. Would it be any more useful if a ring piece was glued to the bottom so you would wear it on your finger while sewing? Or does that just take the cute right out of it? I'm going to make something like that for my niece. She's just starting to sew by hand and has a very small amount of space in which to keep things. Thanks! I found directions to make a little mushroom like that on etsy's blog. I made a red, blue, green, and an orange one. theyre really cute!!! What a great blog!! Congrats on the H&G article, and this is indeed an irresistible small cute thing. I love the little bottle cap pincushions for my needles, because they can't get lost and start coming out the other side. The mushie is a very cute idea. ADORABLE! Mushrooms are just cute anyway, but this one's even beter because it's actually useful!